Ah, Very high quality this is. A devil to put together (I took about 1 hour and a half?) but the end result is beautiful and sturdy. It has a terribly poor movment but makes up for that by the glowing eyes. The cockpit doesn't open much and the bottom of it pops off if I'm not careful, which I am. All in all, I would give it a 9 out of 10. With the Geno Saurer gun, about 6 in. tall. With the Geno Breaker pack, around 8 in. boosters lowered. About a foot tail tip to nose, not including the forehead spike. In 'reality' it is 13.7 meters tall and 23 meters long. Geno Breaker is a very time-consuming model, with great results. The forehead spike is nice and thick, as are the side claws. You can pose him to the Charged Particle Gun pose complete with lowered head and neck, gun exposed for Blade Liger interference, hook-at-end-of-feet ready to lower, and some flaps on the neck/tail to put up. He is red though he comes with both the Geno Breaker pack with booster and Pincer Claws and a Geno Saurer Dual Guns that are interchangeable. Very cool. The feet are huge and the cockpit is in the chest instead of the head like most others. The on/off switch is on his side. If you have the Geno Breaker set on, it is concealed and you must move the right claw up to see it. The claws do NOT come off for the Grappling Claw thing. Pitty, that would complete it. Perfectly. Bugs, they all have 'em. First, and foremost, the Geno Breaker's movment is UGLY. I only turn him on to see the glowy eyes. The arms are supposed to move with the legs, triggering the top claws to move up and down though when I turn him on, the left arm falls off due to pressure. 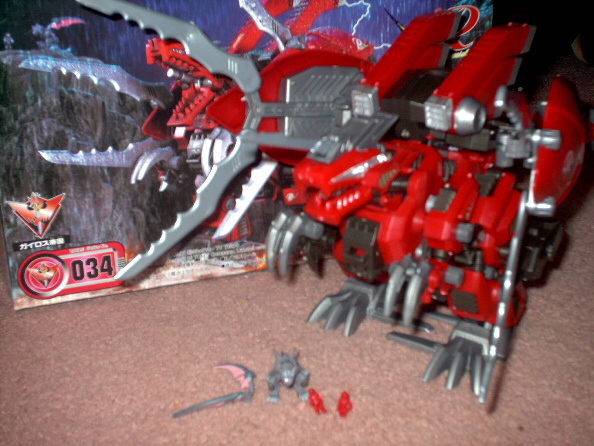 That's really the only bug, if you play with him while he's off, he's a really good Zoid. 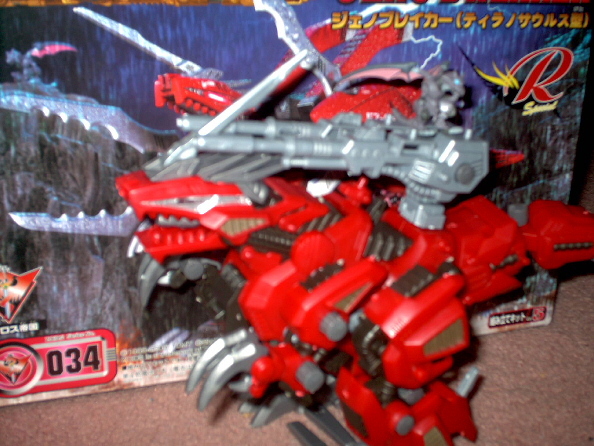 Like I said before, the Geno Breaker comes with a Geno Saurer Dual Gun to switch out so he looks like a very red Geno Saurer. The tail is hollow and I love the thickness of the forehead spike. I just love it. You can pose him is just about everything he's done in the show. The CPG attack to picking up Irvine's poor Command Wolf. The decals have a little 'Raven Special' thing on 'em with is pretty cool and mine can=me with a PAINTED model of Shadow and two UNPAINTED models of Raven. Both Raven models are very small, and red. Geno Breaker red. *insert laughing fit here* The Shadow model comes with an interchangeable closed booster and open bat wings. The bat wings own, and he's all painted up with blue eyes and everything. Powered by two AAA batterys in the belly. No die cast parts and I can't tell how much he weighs. In 'real life' He would weigh around 137.5 tons.